The rope used in Offspring International’s hawsers is manufactured in Double Braid, Circular Braided (Gama 98®) and conventional eight strand constructions. Double Braid is constructed with a separate outerbraided sheath and inner braided core. The balanced flexible construction, distributes the weight and strength equally between the sheath and braided core. Gama 98® is constructed from high efficiency sub-rope cores laid parallel within an outer braided jacket. Each sub-rope is computer monitored during production to ensure all sub-ropes have equal tension and length. The outer jacket is essentially non load bearing. For Submerged Turret Loading and recovery systems, we also use Dyneema® HMPE fibres. Hawsers can be supplied with Integral Flotation system and/or PU encapsulation for increased durability and operational cost savings. Lankhorst’s rope test machine is used in new rope development, establishing project baseline test data and running ‘what if’ scenarios for deepwater ropes by simulating hurricanes and loop current events. 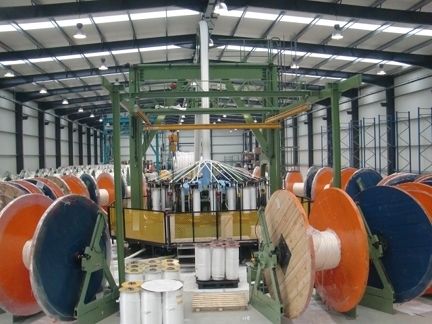 Located at Lankhorst’s Global Synthetics Lankhorst Euronete R&D facility in Portugal, the rope test machine can test 20m ropes with loads up to 1,200 tonnes. It has a primary cylinder rated at 1,200 tonnes x 3m stroke and a secondary cylinder of 1.5m length coupled to a power pack of 350kW. In addition, the machine features a precise mechanical control system designed to maintain peak load such that target loads can be maintained within 10kN during testing. The rope test machine has received its Certificate of Calibration from the National Physical Laboratory (UK). When analysed in accordance with ISO 7500-1:2004, test results for the calibration are within the Class 0.5 classification limits, compared with Class 1.0 limits for most rope test machines.